Generally, I frown upon Zelda spinoffs. Link’s Crossbow Training? Lame. Hyrule Warriors? Seemed to much like a dumbed-down hack and slash to me when it was announced. Even the Zelda levels in Nintendo Land make me cringe. I find there’s just a certain sanctity to the Zelda series that seems to get weathered away when mixed with another game series’ style, and whenever I play a Zelda title, any Zelda title, I want the “pure” experience. That’s why I’m still in disbelief that what I want next for the Zelda series next more than anything is a crossover event with Ubisoft’s Rabbids series. I’m a little late to this party, but I was browsing through my local EB last week and noticed a big Ubisoft sale going on. 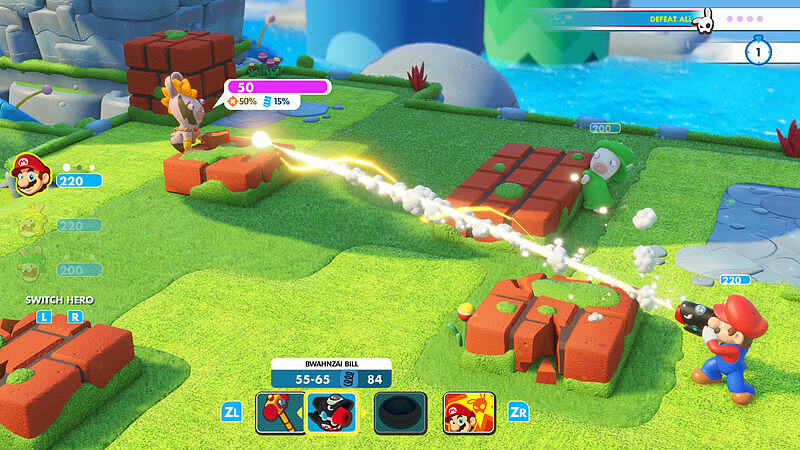 Chief among the discounted games was Mario + Rabbids: Kingdom Battle for the Nintendo Switch. Having never played any of the Rabbids games, but hearing good things about the crossover RPG, I decided to pick it up, and holy cow: this game rocks. The quirky, funny, and creative world the developers managed to make piecing together parts of the Mushroom Kingdom and… wherever the Rabbids are from is a joy to explore. There are all the Mario-isms you would expect from one of his games, and coupled with the sheer ridiculousness of the mischievous rabbits, it makes a truly unique world to explore that’s chalked full of collectables and rocking some awesome N64-Rare-style tunes. The meat and potatoes of this tactical RPG, though, is, of course, the battle system – and thankfully Mario + Rabbids delivers here too. Anyone who’s played Fire Emblem should be pretty familiar with how it works – move your characters, flank your enemies, plan three steps ahead. The battle system doesn’t reinvent the wheel, but it does make some fun additions and provide an incredibly solid foundation to build future games on. But there’s the catch – where would a future Mario + Rabbids game go? It’s too good a game not to have a sequel, but they so perfectly captured the Mario universe in this game, it’s hard to see them replicating that magic in a second outing. With Donkey Kong next in line for the Rabbid treatment via DLC, it would seem to rule out a sequel taking place on DK Island. So where next? I still can’t believe I’m saying it, but dammit, send those mischievous bunnies to Hyrule! I know the gut reaction of everyone reading this is probably “what a dumb idea”, but when I think of reasons that this game couldn’t work, I quickly think of solutions to those problems and come up with new reasons why this game could work. 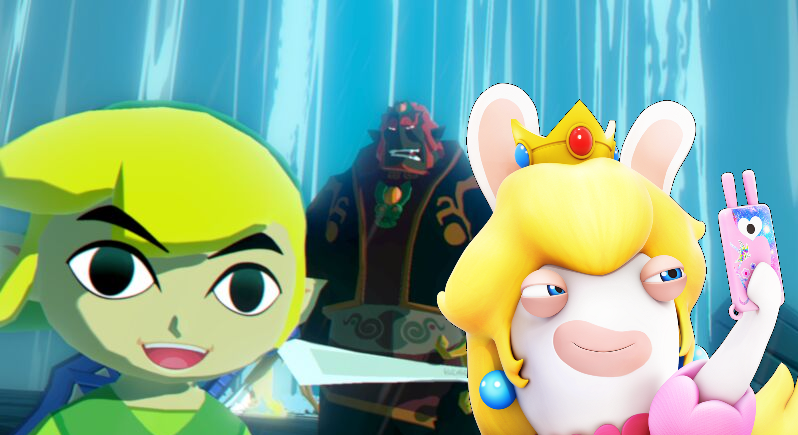 My first immediate thought to myself when I started dreaming of this crossover was the tonal clash – there’s no way a serious franchise like Zelda would feel right mashed up with the lunacy of the Rabbids Universe. But then I asked myself – would the Rabbids and their time traveling washing machine really look super out of place standing next to Toon Link? Let’s face it – Toon Link and most of the characters in that Wind–Waker-style design are lovable goofs. Kinda like the Rabbids. If this game took place in that aesthetic, it would feel right at home. I also wasn’t super high on the idea of my favorite Zelda characters using blaster weapons like Mario and his crew use – but they really wouldn’t have to. Generally, there are three times of weapons in Mario + Rabbids: melee weapons in the form of hammers, long range blasters, and explosives. You could easily substitute the hammers for swords, the blasters for bows or hookshots, and the explosives for bombs or magic. That actually sounds pretty awesome to me. My last reason for initially not wanting to see this game happen takes us back to the beginning – I don’t like Zelda spinoffs. I’m usually against the idea of making them in principal at all – perhaps even before giving any proposed spinoff a fair chance. Not only that, but the one Zelda spinoff that I actually do want has always been an awesome Final–Fantasy-esq RPG set within the Zelda universe – so the idea of a goofy Zelda RPG spinoff that has more in common with Minions than Materia isn’t what I wanted at all. But the more I played Mario + Rabbids, the more I became a believer this could be awesome. Imagine controlling a party of Toon Link, Zelda, Tingle, Linebeck, and their Rabbid equivalents. You’re exploring a corrupted version of Hyrule that those rascally Rabbids have amalgamated yet again with their own world. Instead of exploring the four (soon to be five) worlds that Mario offers, you explore different dungeons – the Forest Temple, Shadow Temple, Water Temple, Ganon’s Castle, and more – fending off different enemies in awesome tactical RPG battle that you could take online with your friends, all the while being offered some pretty incredible fan service. Tell me this doesn’t sound awesome!? 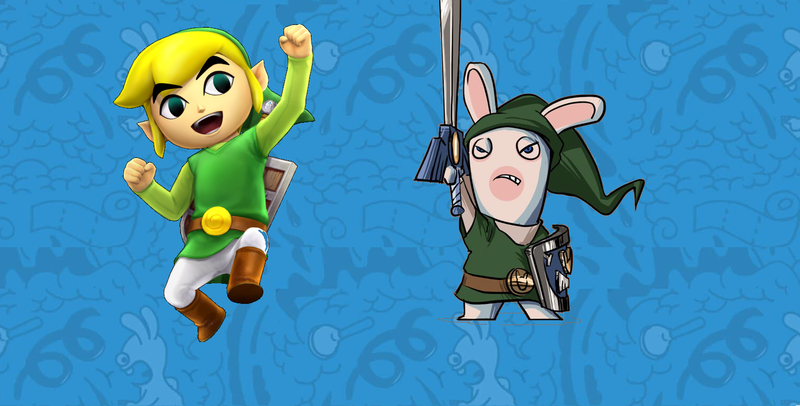 Zelda + Rabbids: Hyrule Battle. It’s a game I never thought I’d want to play, but now one that I’m praying we get. Andy Spiteri is the Editor-In-Chief of Zelda Dungeon. He’s looking for someone to play co-op Mario + Rabbids with. Apply for the position of Rabbid partner by following him on Twitter.